Today proved to be a most disastrous Tuesday, in more ways than one. Fuming mad no thanks to pathetic bureaucracy and red tape, plus stubborn-headed donkey of a boss (the disadvantages of working with the government and under someone from the Jurassic age), we heaved a sigh of relief when lunch hour beckoned. Initially planned to have lunch at Brewster’s in old town, ironically, the cafe was closed for half a day, and only opens for dinner. Oh well, next best choice for a place with air-conditioning? 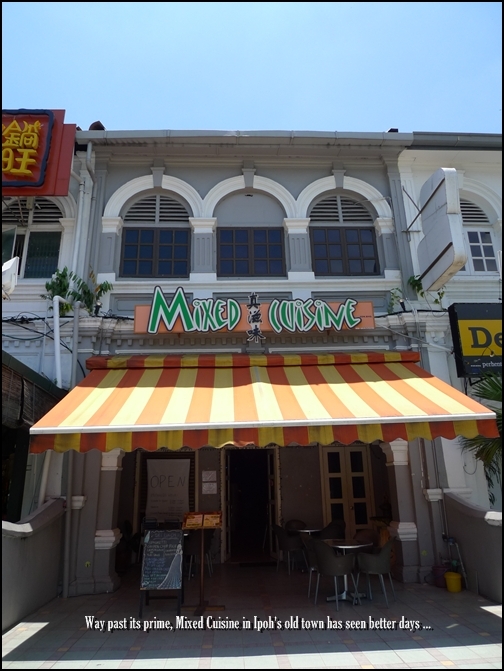 Mixed Cuisine Cafe that faces Padang Ipoh then. This cafe has been around for some time now, and I first wrote about it back in March of 2008, one of my very first few posts back then. Read about our experience HERE. And since then, we’ve been visiting this cafe from time to time, and relished in their above-average set lunches (at least, in Ipoh’s old town, for the other places that serve them, including Momo Steamboat, Miner’s Arms, and Brewster’s were either not good, too expensive, or over-rated). Never before have we seen the Section Closed sign before this ….. But this place has since been taken over (can’t confirm this fact, but the management and staff have sure changed drastically), though the same old, ‘dilapidated‘ menus are still being used. We should have taken heed, bearing witness to the hauntingly empty premise come lunch hour. Yes, not even a single soul in sight, and they even turned off the lights and air-conditioning units before we arrived. Not to say they blasted the place into life the instance we stepped into the shop, but instead the new boss, a small-framed, surly man in his 40’s tried to usher us into the back portion of the shop. He turned on the lights, the air-cond, and proceeded to lay the menus on the vacant tables although we were seated at the front portion comfortably. Maybe a sign of goodwill, for he was probably thinking that we needed the extra privacy (as if lah … for we could have been screaming at the top of our lungs and there would be no other customer to hear us anyway). But once we mentioned that we were not in favour of shifting tables, his expression turned sour, and he proceeded to turn off the lights and air-cond again! Okay …….. NOT the best impression to give the customers, really. Oh, and while deep in his preparation works (a good few minutes), he was even spraying some insecticide/perfume spray around the back portion of the shop. Ahem, let’s hope there were no roaches. Phew, and we thought things could not gone any worse. The same old Set Lunch menu was being used, although prices have been hiked up slightly. The Chicken Chop with Rice sets are now priced at RM8.50, while the Chicken Chop sets are priced at RM10.50. Comes with a drink and desserts. Pardon me for I did not snap a picture of the pathetic plate of chicken chop rice, if you can even call it that. The bits of deep-fried chicken served with an option of sauces (mushroom, black pepper, mongolian, red wine, rosemary, and one other I forgot) were lacklustre at best, and the portion can’t even feed a child, let alone traumatic adults with ravishing appetites. But that’s not even the main grudge we had. The chicken chops were served with a side of coleslaw, a piece of toasted garlic bread, and a dollop of mashed potatoes. So far so good, for they did not change the combination since Mixed Cuisine incorporated those into their Western sets back then. Most glaring difference? The portion, and presentation. Refer to the first photo above and tell me you’re tempted. No? Can’t blame you. Drizzles of diluted Mongolian sauce (it was really good last time), on a piece of aged, frozen chicken, and served with a piece of toasted stale bread. But worst of all, the mashed potatoes was SOUR. Yes, DAMN SOUR. And thus we sent the plates back to the kitchen, only to be told with the excuse that they were MEANT TO BE THAT WAY. WTF. I know my mashed potatoes, and even though they’re from the pre-mix, canned varieties, they’re NOT meant to be sour. It was either they went overboard with the Worcestershire sauce (for whatever reason), or as we believed, the mashed potatoes was spoiled. The cook did walk out and apologize profusely, and promised to change the potatoes to fries instead. Okay, we relented and waited. Until the boss casually carried the same plates to our tables and nonchalantly commented that IT WAS THE MARINADE, and IT’S MEANT TO BE SOUR. Needless to say, we were damn pissed off. Short of throwing tantrums and walking out, we paid and left, without even touching the desserts. In case you’re curious, it’s either the same old ice-cream or jelly. But not before we gave the staff a piece of our mind, with the PR skill-ZERO boss hiding behind the counters. And yeah, there was even 5% service charge in the bills, for all it’s worth. Unjustified? Daylight robbery? Directly facing Padang Ipoh in Ipoh’s old town. Here’s to better eatin’ and better service for you tomorrow! Thanks Kenny. We were seriously appalled by the service and the food there. Never again we’ll return, unless of course …. another eatery opens in the same premise. At least what we suffered most was the smoke and grease huh? 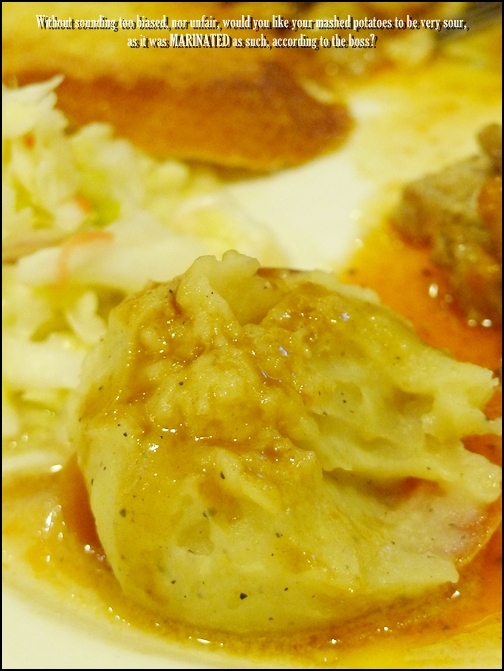 Sour mashed potato? tsk tsk tsk…. Why not just walk away after you complaint and didn’t get an satisfying feedback? Or at least you pay without the 5% service charge…. Oh..thanks 4 the warning. Was actually thinking of hoping into this eatery on weds nite after say 1 year + since our last visit. BTW, do try out one new cafe call Cappuccino open by award winning chef I suppose. Its @ Jln Chung Tye Ping or few shops away from Australia Pediatric clinic or near Ave Maria school. Try it out. I kinda of like the place actually. Cappucino Cafe? Okay okay, good. I’ll take note of this. Same row with the Fantasy Cafe? Actually d other block..same row with Australia child specialist clinic. Cant wait for ur review. When my wife and I ate there 2 years ago, we were already unimpressed with the food. That was our first and only time eating at Mixed Cuisine. I guess this place won’t last long. Treating customers like that, they deserve to go out of business. Thanks for the warning. Really? Haha, guess we were really not that choosy bout our food, for we thought the food at Mixed Cuisine was passable, when compared to the others around old town. Of course, that was back then. Now, I doubt they can last even half a year. Bad service at a restaurant can totally ruin your dining out experience. yikes! at least it’s a catchy name for a restaurant, so it’ll be easy for us to remember to avoid it if we’re ever in ipoh! ahahaha – dun abuse the lemongrasses lah. Sorry to hear your bad experience – it really spoils mood if you eat sucky food or have sucky service. BOYCOTT these people! Will serve them right. They can’t possibly last a minute longer in business!! I am enraged just reading your post!! ROARRRR!!! Thanks for the RAGE!!! Hahaha … thankfully, the lunch we had today at David’s Diner was WAY WAY better in comparison. 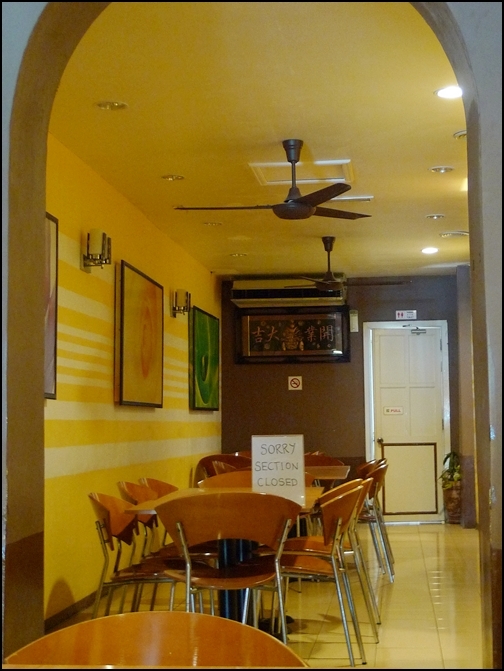 I went there a few years back when I was still in Ipoh and I think it was a passable place even though the price wasn’t. But still I reckoned it wasn’t too bad until I read what you wrote. I wish the owner knew who he was serving and the magnitude of damage he has done to his business. That’s just ridiculous. FYI I’m working as a part-time waiter in Australia and you know what the people do here when they have a bad meal? They would demand compensation (exempted from paying, discount, free round of drinks) and to the extent of giving me a piece of their mind, and normally I had to apologize on behalf of the chef (who in your case had the decency to come out and did so) and hope that he doesn’t spread bad things about us. PS There’s like a couple of shops around the corner, like Old Town? I know its not something you would normally do but I guess OT would serve better Nasi Lemak and Curry Mee than MC to compensate for your lunch ma. Hahaha, nice comment there, Philip. Thanks. Yeah, service-wise, Malaysian eateries have a LONG LONG way to go. Old Town? Yeah, Padang Ipoh’s Old Town is hands down, the outlet with the BEST service in Ipoh. Josephine at Ipoh Garden South once served ‘fresh’ cream turned ‘sour’ with scones. After bringing to the waitress attention, they just took it back – with lame apologies, but at least they took it out of the bill. It was my first and last visit to Josephine. Josephine again? Huh … I’m surprised they have yet to act on all the bad reviews. At least, they apologized. This one, the boss did not even have the guts, or effort to say sorry. 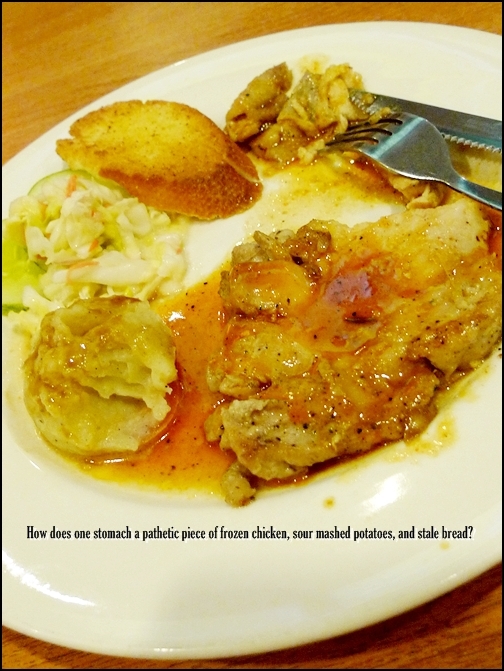 Oh yeah … yesterday’s was a passable meal at Kenny Roger’s, and today was a sumptuous set lunch at David’s Diner in Ipoh. Kinda compensated for all the losses? waaah.. dat’s bad! the only time i like my food sour is if its tomyam, or a lime based thing or a asam based. i do not like sour potato! and to be so cocky and adamant is bad la.. agree..
Yeah, damn cocky. I was about to forget about the matter once the cook agreed to change to fries, ONLY to be duly presented with the almighty excuse of SOUR MARINADE for mashed potatoes. Hahaha …..
Bad bad bad – thanks for the warning, hehe! Totally appalling and unacceptable! OMG…totally a daylight robbery and with such manager or whoever is running that cafe is totally not customer service orientated. Maybe some grown up kampung boy who tries to make a life out in town. Such attitude and character being describe above as you did cannot be tolerated. If I were to I would call in the National Environment Agency to inspect the premises including what they serve. Sour marsh? ?ewww…the chef is good enough to change though, the manager should not even take it out and said IT IS MEANT TO BE SOUR. Think again, IS HE THE COOK??? he is just making trouble trying to fuse you up. By the way, with the impression that the manager gave away by putting the SORRY SECTION CLOSE and such “YAYA” character shown, the cafe is actually not making any money and therefore he is saving cost AND robbing you. Wish I could come back to Ipoh and patronize that place. See how he treat me, if he treat me like how he treated you. IT’S SHOW TIME! Well, I am after all the Service Operation Manager in Food & Beverage Department in Sentosa, Tanjong Beach Club, Singapore. LOL. Thanks Cedriza, it was a riot reading your elaborated comment! However last I passed by, the cafe seemed to be closed.